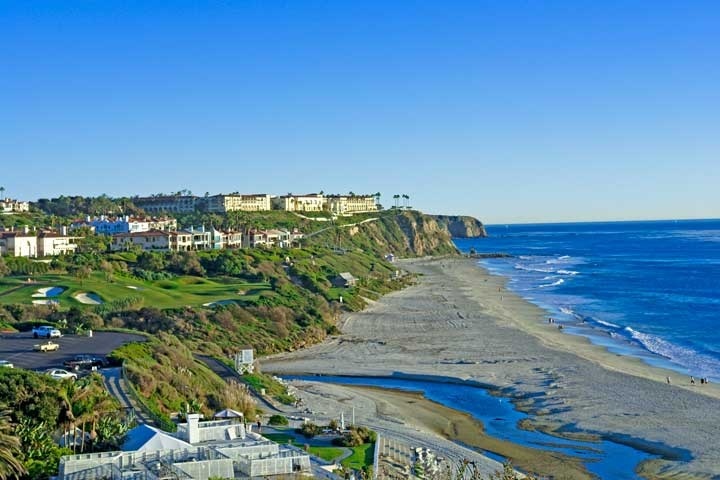 The coastal community of Monarch Beach is situated between Dana Point and Laguna Beach,California. This upscale waterfront community is a beautiful resort style suburb of Dana Point, which boasts incredible sunsets,and world-class hotels. Two world class hotels are the St Regis and The Ritz Carlton which offers world-class amenities and service. Top rated golf course, The Links at Monarch Beach Golf Course is considered one of the best in Southern California. Right next to the Ritz Carlton you will find Salt Creek Beach which is a favorite among surfers. There are many beaches that provide visitors and residents alike with a true beach community living. Monarch Beach is just minutes from downtown Dana Point and Laguna Beach where there are top rated restaurants and shops. The homes in Monarch Beach are among the best with many of them located behind gated communities. These private communities like the Ritz Cove offer upscale direct beach access. Monarch Beach is truly a quaint resort style town and Beach Cities Real Estate has represented many homes for sale in Monarch Beach. For a complete list of Monarch Beach neighborhoods and properties available, please scroll down. Looking for information on Monarch Beach Real Estate? Our team of Monarch Beach Realtors® and Monarch Beach Real Estate Agent Associates can assist you in finding a home here in the Monarch Beach area. Please call us at 888-990-7111 for immediate assistance. For a complete list of Monarch Beach neighborhoods and properties available, please use our direct links to the right. Monarch Beach Homes for Sale: We have dedicated pages for search of Monarch Beach properties. If you are looking to buy a home in the Monarch Beach area please visit our dedicated Monarch Beach Home Search page to view all the current homes for sale in Monarch Beach. Monarch Beach Rentals: If you are looking to rent a home in Monarch Beach then please visit our dedicated Monarch Beach Rentals page to view all the current available rental properties available in Monarch Beach. Monarch Beach Home Sales: Interested in selling your Monarch Beach home or curious to know what a Monarch Beach home sold for? You can research all Monarch Beach home sales for the past 12 months on our website! Please visit our Monarch Beach Sold Search page to start your search. Monarch Beach Short Sales: If you are looking to buy a home at a discounted price then please make sure you look at our Monarch Beach Short Sale homes for sale. Homes that are offered as a short sale are typically a lower market value home than other homes on the market. You may have to wait several months while the banks process the short sale but the end result is a great house at a great price! Monarch Beach Foreclosures: If you are looking to buy a foreclosure home in Monarch Beach we had a dedicated page to show you all the bank owned and foreclosure homes for sale in Monarch Beach. Please visit our Monarch Beach Foreclosures page. Our Team of Monarch Beach real estate agents specialize in Monarch Beach Real Estate and can guide you through any of your Monarch Beach Real Estate needs. We our proud to have some of the top realtors working here at Beach Cities Real Estate. Interested in Monarch Beach Real Estate for sale? For a complete list of Monarch Beach homes for sale please visit our Monarch Beach MLS search. All Monarch Beach homes and Monarch Beach Condos for sale are also listed below in the various Monarch Beach neighborhoods. Questions? Let our team of Monarch Beach Realtor Associates help you. Call us at 1-888-990-7111 or contact us via email. For information on other real estate and beach homes for sale in the Orange County area please visit our MLS Orange County Real Estate Property Search. "A Monarch Beach home in the Antigua neighborhood has just been sold by the McDonald Team of Beach Cities Real Estate. nbsp;33 Saint Michael, Dana Point sold for $965,000 and closed escrow on 09/08/... "